Heat oven to 350°F (325°F for dark or nonstick pan.) Spray bottom and sides of 2 (9-inch) round pans with baking spray with flour. In small microwavable bowl, microwave 3 oz white chocolate and 2 tablespoons whipping cream uncovered on High 1 minute, stirring every 30 seconds, until smooth. Cool 10 minutes. In large bowl, beat cake mix, sour cream, oil, eggs and white chocolate mixture with electric mixer on low speed 30 seconds, then on medium speed 2 minutes, scraping bowl occasionally. Pour into pans. Bake 18 to 20 minutes or until toothpick inserted in center comes out clean. Cool in pans 5 minutes; remove from pans to cooling racks. Cool completely, about 1 hour. In small microwavable bowl, microwave 6 oz white chocolate and 1/3 cup whipping cream, uncovered, on High 1 minute, stirring every 30 seconds, until smooth. In medium bowl, beat butter and 2 cups of the powdered sugar with electric mixer on medium speed until blended. Add white chocolate mixture; blend well. Add remaining powdered sugar; beat until smooth. Place 1 cake layer on cake plate, top side down. Spread with 2/3 cup frosting. Top with remaining cake layer top side up. Frost side and top of cake. 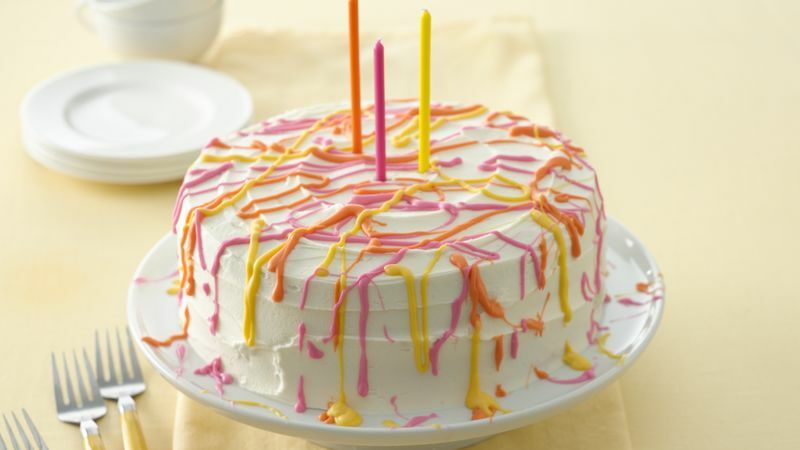 Using teaspoon, splatter top and side of cake with melted candy melts, alternating colors. Let stand at room temperature until 30 minutes or until set. Look for the candy melts at craft and specialty stores. Sometimes they are available at large grocery stores too.